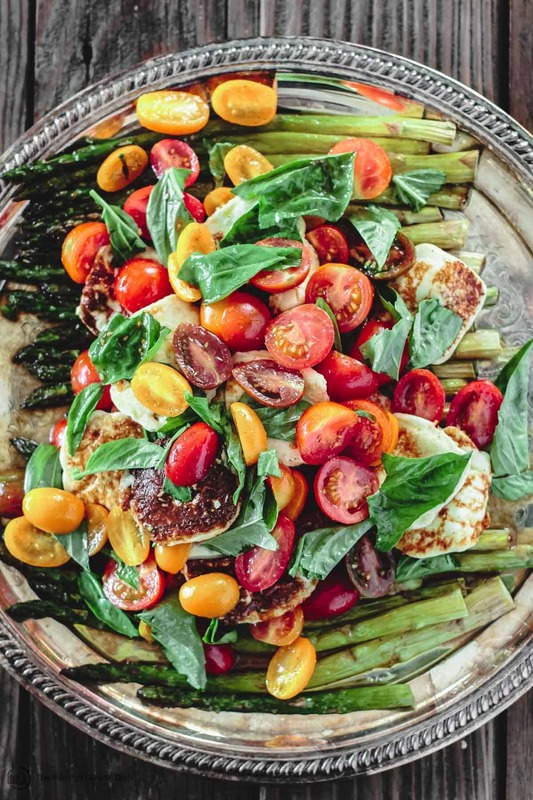 Easy roasted asparagus salad with tomatoes, basil and a lightly sherry vinaigrette. Serve it as a vegan salad or side dish, or add fried halloumi cheese or creamy Greek feta if you want a bit of an indulgent twist. This simple roasted asparagus recipe makes a show-stopping gluten free side! 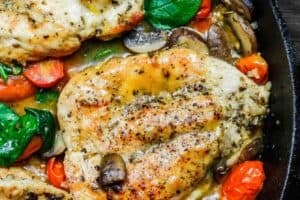 My favorite recipes are often the bright ones made of just a few ingredients that have been cooked simply. Case in point, this asparagus salad. The stars here are: roasted asparagus, tomatoes, and basil. I know some of you are thinking, what about the fried halloumi cheese? It’s totally optional, but it does add a bit of an indulgent twist, taking this roasted asparagus recipe to a new level of special. We’ll talk about halloumi in a bit, if you’re curious. 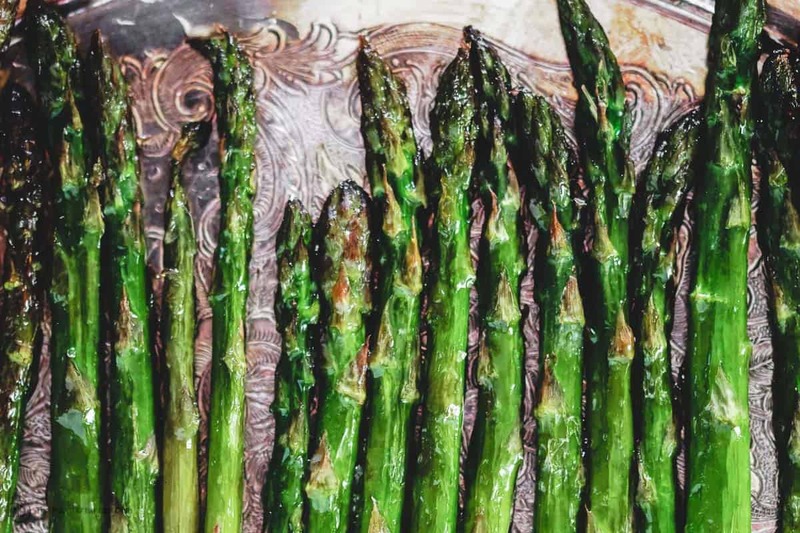 This roasted asparagus recipe is really more than a salad. Flavor-packed, and so beautifully constructed, it can totally steal the show. And luckily, it’s quite simple to prepare. 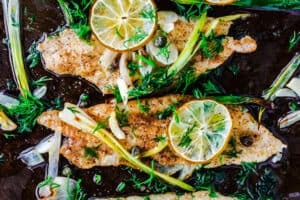 Obviously this recipe begins with asparagus (before you do any cooking, be sure to remove the hard ends.) Season the asparagus with a dash of salt, then add a drizzle of quality extra virgin olive oil, before roasting in a hot oven until perfectly tender. A good handful of fresh basil leaves finishes this roasted asparagus salad. 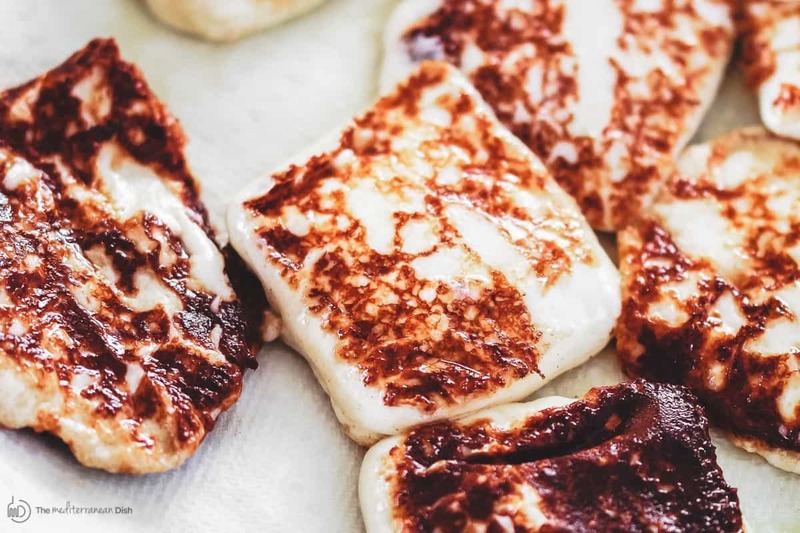 What is Halloumi Cheese? And Where to get it? Halloumi is a firmer, brined cheese that’s popular in places like Cyprus, Greece, Turkey, and parts of the Middle East. Halloumi holds its shape beautifully even as it cooks, which is why it’s perfect for grilling or frying in olive oil (like we have here). You can typically find Halloumi cheese at specialty grocers, but I often buy it online here. And if you’ve not tried fried halloumi cheese before, you are in for a real treat! It’s hard to fully describe how wonderfully indulgent, yet not at all overbearing, every bite is. 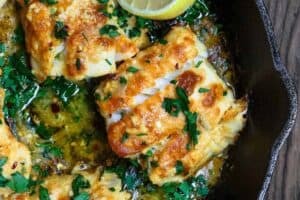 Do I have to use halloumi cheese in this recipe? I’ll repeat this here again, if you’re vegan, you can absolutely omit the halloumi cheese in this roasted asparagus recipe. 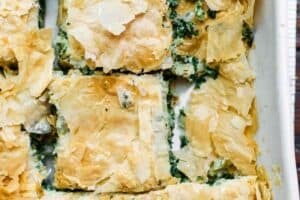 Or, if you’d still like to use some cheese, cubes of creamy Greek feta work well here added at the very end (of course, you do not need to fry feta cheese). 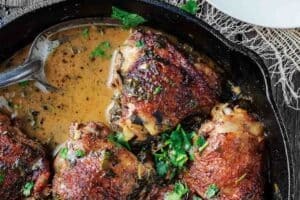 See recipe notes for instructions. 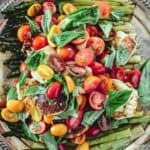 Easy roasted asparagus salad with tomatoes, basil and a lightly sherry vinaigrette! Use fried halloumi or cubed feta cheese if you want a bit of an indulgent twist. 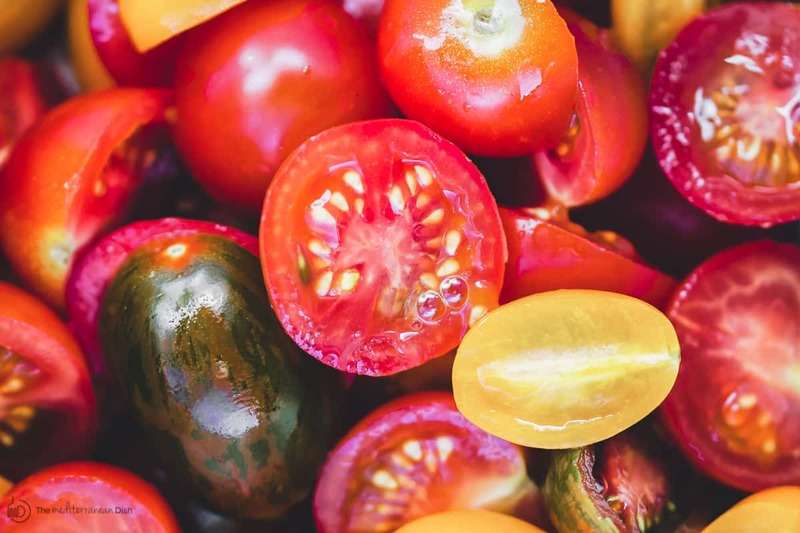 Makes a bright, show-stopping salad or side dish. Place the asparagus spears on a large oiled baking sheet. Sprinkle with salt. Drizzle with extra virgin olive oil (toss to coat and be sure to spread asparagus in one layer.) Roast in heated-oven for 15 to 20 mins until tender. Remove from heat and let cool slightly. To make the vinaigrette, whisk together the vinegar with the extra virgin olive oil, garlic, sumac, salt and pepper. 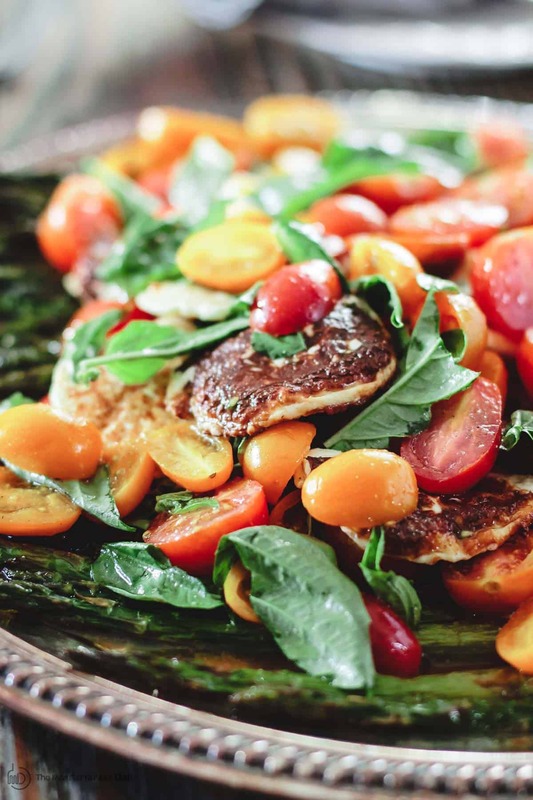 In a mixing bowl, combine the grape tomatoes with the fried halloumi and toss them together with the sherry vinaigrette. Assemble the roasted asparagus on a serving platter and top with the tomato and halloumi mixture. Finally, add the basil leaves. Enjoy. Tip: halloumi cheese is optional here. If you want to keep this recipe vegan, omit halloumi. If you’d still like to use cheese, you can add creamy Greek feta instead. Do not fry the feta, simply add it at the very end when you add the basil leaves. Recommended for this Recipe: Early Harvest Greek extra virgin olive oil. SAVE! 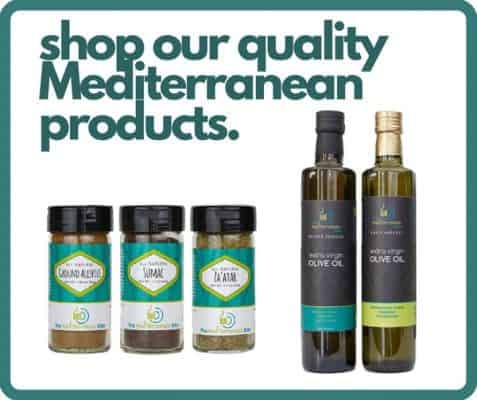 Try our Extra Virgin Olive Oil Bundle! Recommended for this Recipe: Sumac spice. SAVE! Create your own 3-pack or 6-pack from our all-natural or organic spice collections; or try our Ultimate Mediterranean Spice Bundle. Hello, Suzy I joined gym in last week, so I was looking for the salad recipes. Yesterday I found & try it after. Its very nutritious and I definitely try it twice to thrice per week. Thank you. I grew up eating halloumi cheese so this recipe brought back so many memories. It was so SO good. I love Halloumi cheese. This was delicious! Awesome, Eden! Thanks so much for trying this! This is calling my name!!! I have to make this ASAP!! !